Diamante (2008) at Central Terminal in Buffalo, NY! 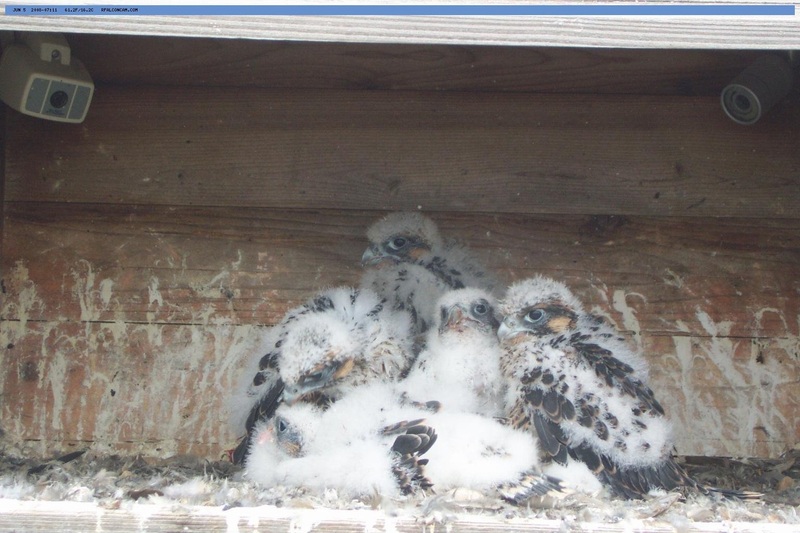 Thanks to Rochester Falcon Watcher Joyce Miller, we have this wonderful news to share with everyone. 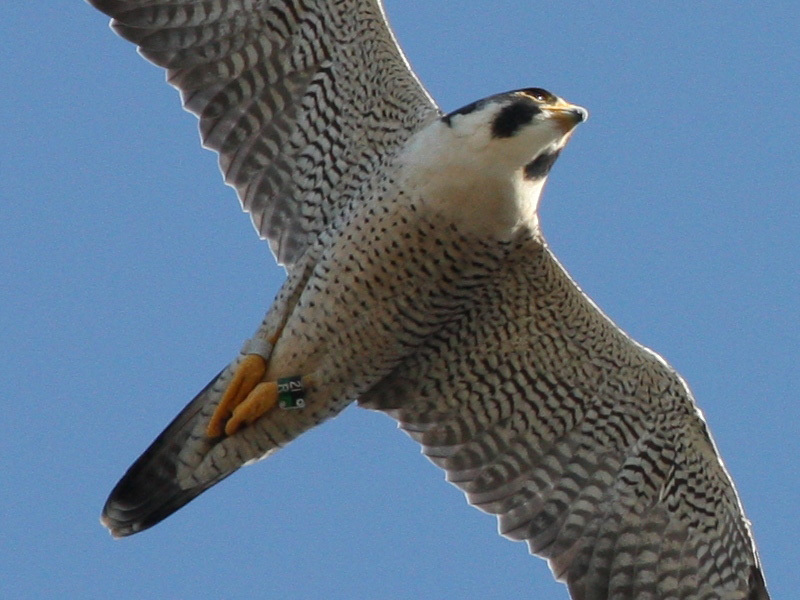 Diamante has been positively ID’d and is the current tiercel (male) at the Central Terminal in Buffalo, NY! 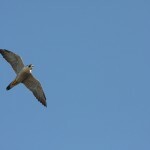 Here are a couple pics that Joyce took while visiting this nest site on Thursday, October 25th. There will be more current pictures of Diamante shared as soon as we receive them. Diamante’s band is 21/R black/green. He was named by Ms. Dawson’s Class, School 28, in Rochester, NY. 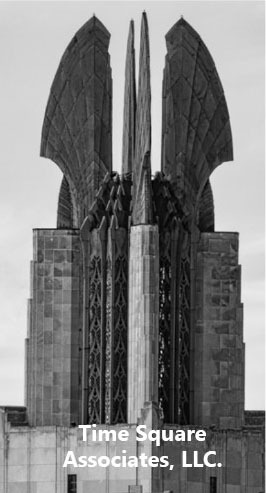 This year (2012), there was a change at Central Terminal in Buffalo, NY. Stash and Stella were gone and there was a new pair in town. 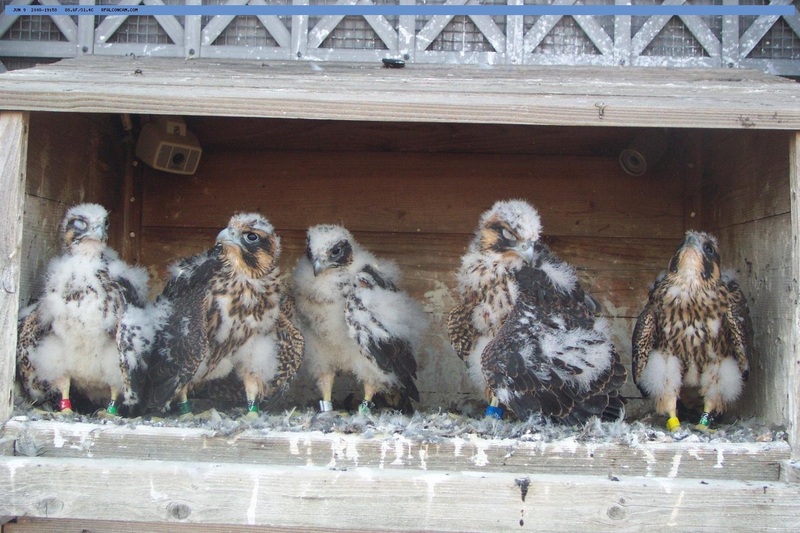 The Buffalo and Rochester Falcon Watchers teamed up to attempt to get ID’s on this new pair. The female was ID’d fairly quickly. 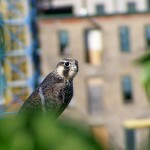 She is Gleig, hatched in 2009 at the Hamilton Sheraton Hotel nest site. The male continued to elude identification by the Watchers, until now! 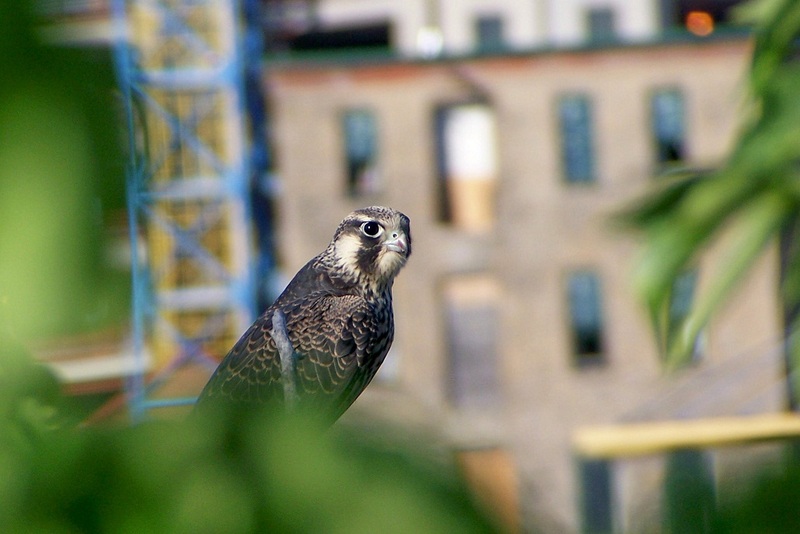 We are very happy to announce that the new tiercel (male) at Central Terminal in Buffalo, NY this year is none other than our very own Diamante from 2008. He is the son of Mariah and Kaver and brother of Quest, Linn & Rhea Mae. He hatched the same year as Quest. Here are some pictures of a very young Diamante and his brothers & sisters. Diamante and Susan B were the last to hatch in 2008, but they very quickly caught up with their siblings Quest, Seneca, & Zephyr. Here are a couple of pics from 2008. The first one is Diamante peaking through the tree branches on the gorge wall. The second picture is of Diamante and Quest in a game of talon tag above the Genesee River. 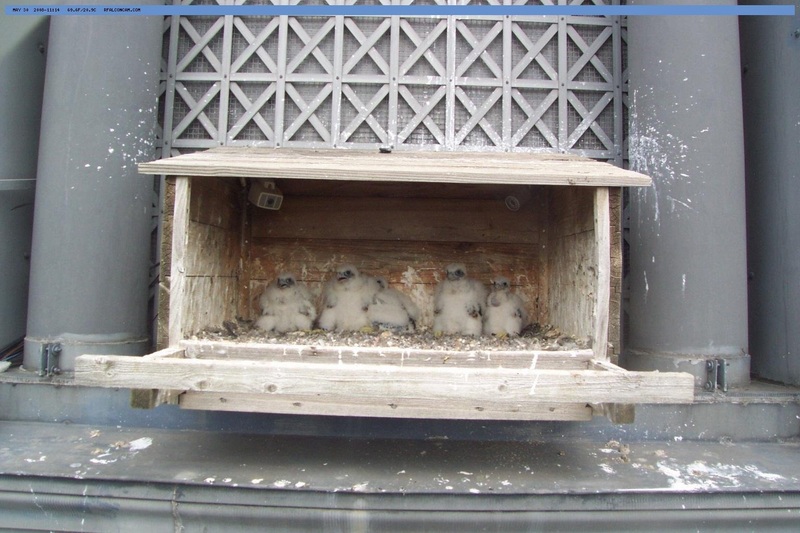 In 2012, two young females hatched on at the nest box at Central Terminal, Alfreda & Wagner. The Mariah & Kaver Legacy continues! Great News! 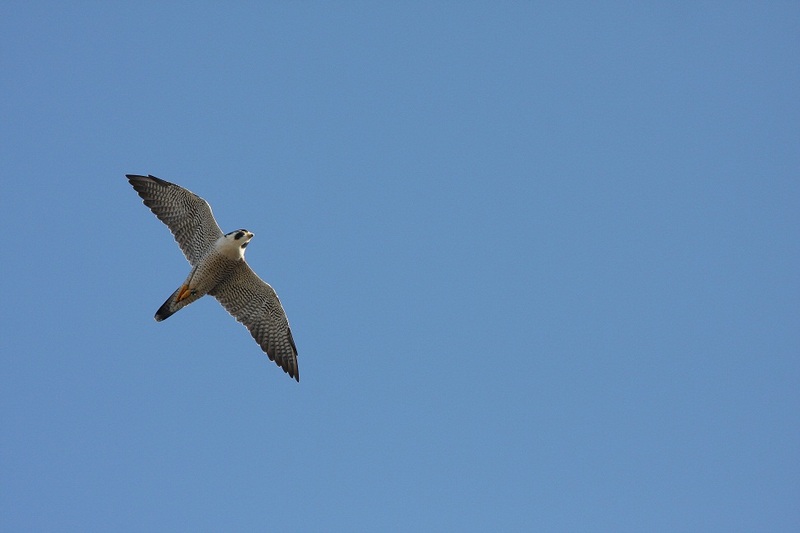 We Have Positively ID’d the Tiercel (Male) at Central Terminal in Buffalo! DIAMANTE! and you are NEVER going to guess who it is! More information and pictures coming very soon! So much happened this year, some good, and some bad. 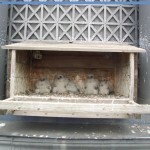 But, in the end we all cheered as a very small eyas broke out of his egg under his dad in the nest box on top of the Times Square Bldg. After all the sadness of this year, this young falcon made his way into our hearts. At his banding day, our friends at the NYS DEC determined that this young, feisty falcon was a male and he was given the name Orion, suggested and chosen by the members of the Rochester Falcon Forum. His parents, Beauty and Dot.ca, after finally settling their differences, got down to the business of caring for their young son, who wanted for nothing. Both of them would bring in food and feed him. His crop was always full and he grew up to be a very handsome young falcon. Orion was very entertaining and gained many fans from around the world. His antics in the nest box were amusing and he formed a strange bond with a rock named Orville, who “fledged” just after Orion did. Orion fledged on August 2nd. 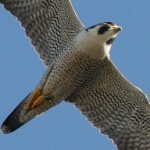 The GVAS/Rochester Falcon Fledge Watch was in full swing and many Watchers were there to witness his first flight. From the beginning he was a superb flyer. There were a few rough landings and a couple of bounces off of buildings. But, he learned quickly from his mistakes and was soon chasing his parents around the skies of downtown Rochester, much to the delight of his Watchers. 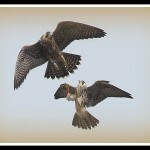 The Rochester Falcon Forum members were buzzing, sharing pictures and reports of his exploits. 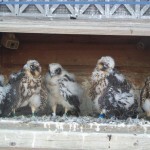 He was a late hatch, so many folks from other falcon nest locations joined us once their own young left. Then one day he was gone. Saturday morning, September 8th, was the last time we saw him. Watchers on the Broad St Bridge were thrilled to have both Beauty and Orion on the front of the Rochester Library. Beauty had hunted successfully and was enjoying her early morning meal. Orion waited patiently a few feet to her right. After she ate her full, she brought the remainder over to Orion. Beauty returned to the corner of the library to keep guard over her young son while he ate. Beauty took off and flew to the nest box. Eventually Orion followed her. He grabbed the remainder of the food and flew towards the Times Square Bldg. He landed on a lower, nearby building and left the remains of his meal on that roof before taking off again. That is the last time there was a confirmed sighting of Orion by any of the Rochester Watchers. 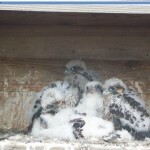 The folks who had been watching Orion daily since he fledged were not concerned. Before he left, he had been seen successfully hunting and honing his skills with his parents. He was flying incredibly well. 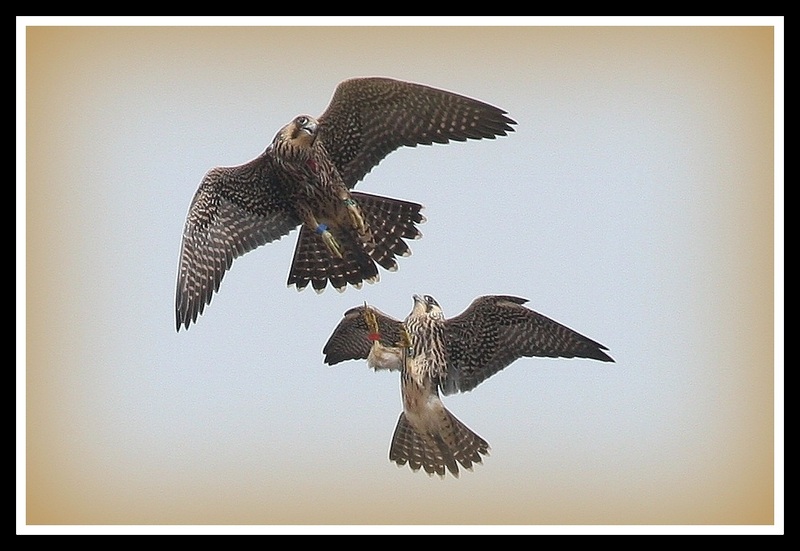 It was his time to leave us, to go on his life journey to become an adult Peregrine Falcon, to find a mate and raise young of his own. We wish him fair winds on his travels. Stay safe Orion. We hope to see you again. 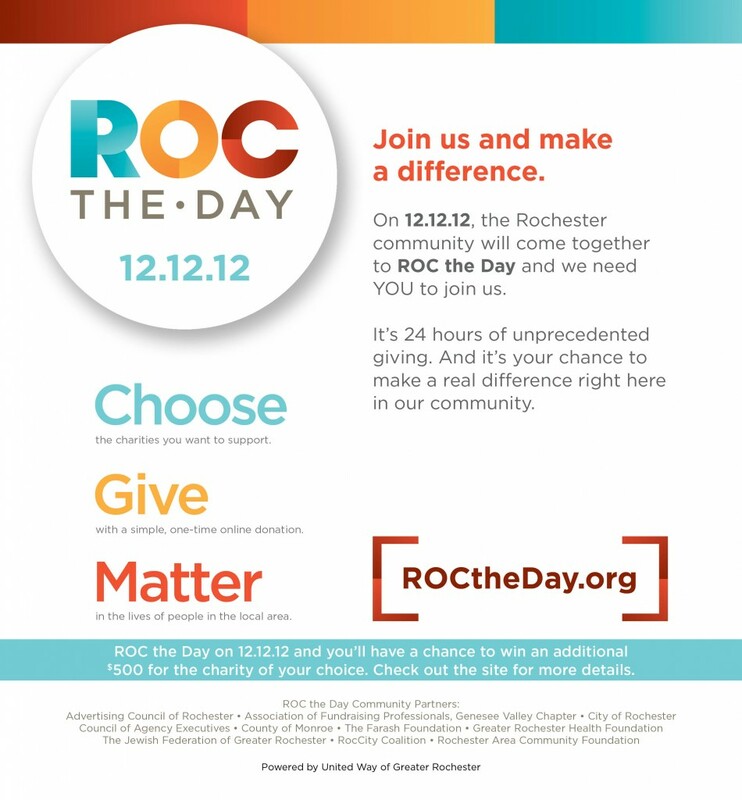 ROC the Day returns this year on 12/12/12. After such great success last year (thanks to our generous supporters!) Rfalconcam will be participating once again. We’ll be sure to keep you posted as more information become available. You are currently browsing the Imprints blog archives for October, 2012.